Utricularia Graminifolia Tropica 1-2 Grow! Utricularia graminifolia is part of the bladderwort family and can make a nice foreground plant for those injecting CO2. Medium to high light and CO2 injection is of importance. It can be used to create stunning carpets or wedged between rocks and wood. 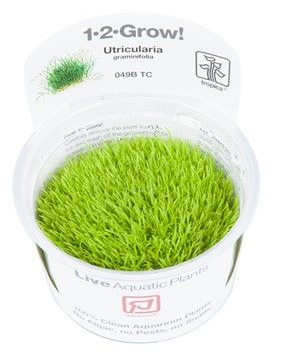 Each pot has a diameter of 60mm .All tissue culture plants are free from snails, algae and pesticides. The cups can be kept for a relatively long time before planting (sometimes weeks) meaning you can plant when you are ready. Keep in a cool place, sub 20 degrees and out of direct sunlight. Tissue culture plants are young plants with strong roots and are in much better health than their potted versions. Only open cups before planting to avoid contamination. CO2 and good fertilization will promote healthy growth.